The donkey is a very intelligent animal contrary to popular belief, which (who) has to be educated, and not broken in. It is an excellent pet who likes affection, grooming with the currycomb, and walks with its owner. One could believe it to be timid, but actually it is a cautious animal. A donkey which is not accustomed to walking on the road, will stop in front of a pedestrian crossing, drain covers, a puddle of water..., and will categorically refuse to move. It will then be misinterpreted and thought of as a stubborn animal. It needs educating with a little patience, to give confidence, to reassure it, and very quickly, it will cross all these obstacles naturally. When a donkey has a good education with the excursion and the carting..., it memorizes for a very long time all that it has learned. The donkey has a very sure step, and if you observe it, you will note that it moves as if on a line. That gives him a serious advantage compared to the horse to cross very narrow and dangerous paths in mountainous area's. 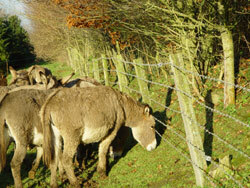 The cry of the donkey or song is called the braying. The sound can travel several kilometers. Another characteristic of the donkey: several times per day, it adores to do roll in dust, generally always at the same place, that one calls a "bath". 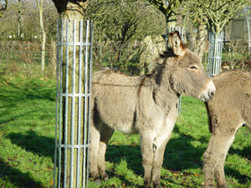 But the donkey also appreciates tree bark; it is thus necessary to protect your trees, by a fence for the hedges or steel corsets for the other trees. For the wood huts, remember to protect the angles and the doors by using a piece of iron sheet to avoid any unpleasant surprise!